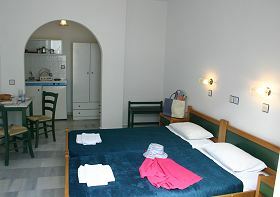 The Nostos Studios are found at an ideal area of Chora (Naxos Town) on Naxos island. These recently built studios offer peaceful holidays as they are spacious, fully equipped and aesthetically pleasing. The discreet environment promises a well-deserved, relaxing and enjoyable stay. It is located just 70m (77yds) from the awarded, sandy and cozy Saint George beach, where you can enjoy a lovely swim, food and beverages and only 150m (164yds) from all other amenities in downtown Naxos. Furthermore, Nostos Studios is located very close to the public parking, mini markets, post office, banks, car rental agencies, internet cafes, laundry, restaurants, traditional taverns, clubs, coffee-shops, travel agencies, any kind of shop and the magical Venetian Castle!